For my sister and my birthday present on Saturday 22nd of February (and my birthday 18th of June!) 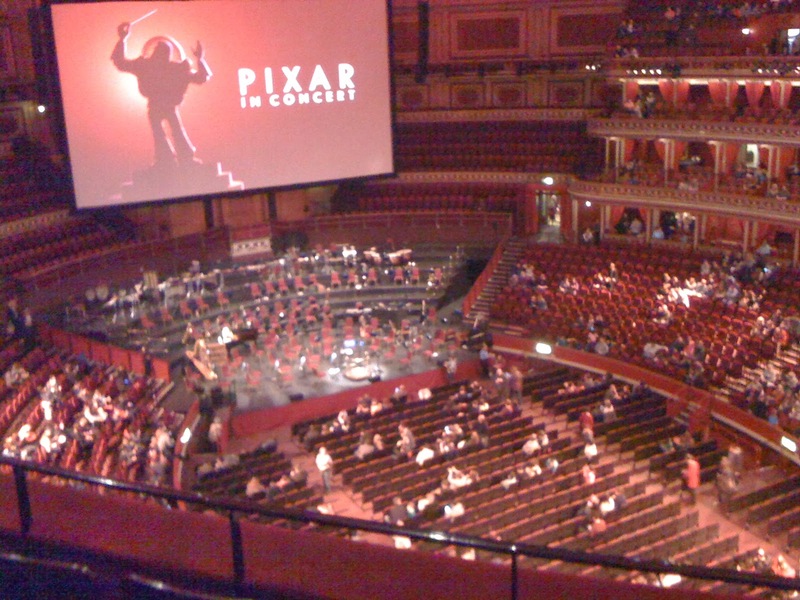 my mum, dad, sister and I all headed up to London to watch Pixar in Concert: parts of Pixar movies with a live orchestra playing the music at the Royal Albert Hall. When I first stepped in I gasped because the insides of this Royal Albert Hall were spectacularly beautiful, Prince Albert must have been very fortunate to receive a gift like this from Queen Victoria. Seats were red velvet and went right around the hall. The acoustic panels on the roof were big circles so they seemed like decoration. Pink illumination lit up the hall and down below (our seats were up high) was orchestra. I could see all kinds of instruments including a harp, a trombone and a row of lots of different percussion instruments like the cymbals. Then the music begun. It was brilliant so, life-like, delicate, emotional , well-played and brilliant. When they showed Wall-e it brought tears to my eyes because when I was little my mum and I went to watch it and it was really good but really sad. Up was also very brilliant music but extremely sad. I would say my favourite was The Incredibles as it was joyful, funny, happy and very well-played. Although now I come to think of it, I did like Monsters Inc. as well. Having watched this clips with the live orchestra, it has made me want to go and watch Brave, Ratatouille and definitely The Incredibles. And even though I've watched Cars 2 over a trillion times, thank my brother, I still thought it was amazing. I left the Royal Albert Hall feeling very happy and pleased chatting away to my family about which was best, I think we all liked The Incredibles so lets say that was our favourite. This was the premiere for Pixar in Concert and it's now travelling around the world. If it comes near you you MUST go and see it - it was zard amazing. In the Interval we guessed how many seats we thought were in the Royal Albert Hall and the closest won a pound. Well, I guessed 5,000 and I was closest - there are about 5,272 seats. That's a LOT!!! Sounds Awesome! Wish I could go! Also, that was a good guess! How many people were at the Hall? There doesn't look like many! There were a lot of people - at least 4,000 probably a lot more; I did take that photo when barely anyone was there.